For a working implementation of this project see the sample app. add library dependency to your build.gradle file. Include the UniversalVideoView and UniversalMediaController widget in your layout. This should usually be placed in the same parent ViewGroup, which makes sense when in full screen state. 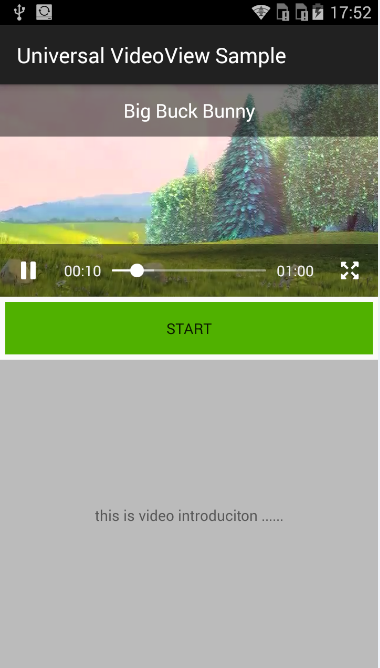 In your onCreate method, set the UniversalMediaController to the UniversalVideoView and implements the UniversalVideoView.VideoViewCallback Callback. Support Android Gingerbread V2.3(API Level 9 and above). UniversalVideoView does not retain its full state when going into the background. You should save or restore the state and take care of the Activity Lifecycle. You may need to set the android:configChanges="orientation|keyboardHidden|screenSize" for your Activity in AndroidManifest.xml to prevent the system from recreate the Activity while phone rotation. 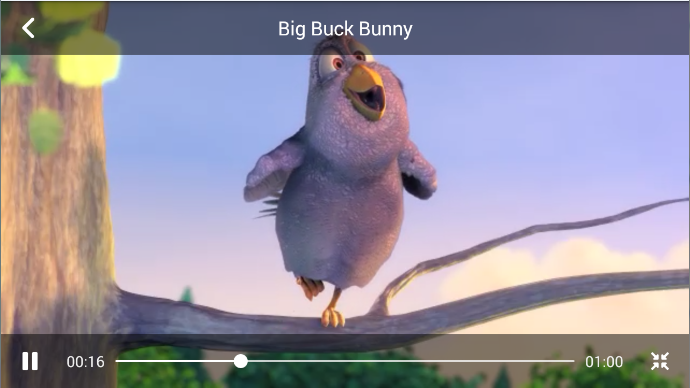 uvv_fitXY, Video scale to fill the VideoView's dimension or keep Aspect Ratio (default) likes Android framework VideoView. uvv_autoRotation, auto switch to landscape(fullscreen) or portrait mode according to the orientation sensor. uvv_scalable, show or hide the scale button. if you will not play the video in fullscreen.